For all of your website needs, we mean to please! To get started, give Edwin a call at 836-6185 or 624-4344. All it takes is $300 a month to improve your business & increase profits. 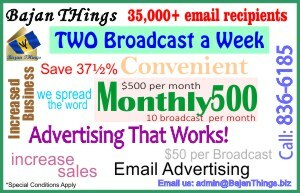 As an option, you can choose our - Monthly 500 - where your ad is broadcasted to our 35,000+ recipients, twice a week, every month - that’s up to 10 times - for only $500. Starting a Business or running a Small Business is Exciting, Challenging, Rewarding and Costly. Cash Flow is Paramount and Clients are in short supply. To Help you grow we offer steeply discounted tailor-made advertising packages for new & small businesses that addresses the problem of Cash Flow and Clients. Give us a call, lets’ talk and I guarantee we will work out something that benefits us both. Our winning formula is made up of Trust, A Can do attitude, Some Cash, maybe some Bartering. All we ask in return is for repeat business in the future when you are successful. It starts with a telephone Call !!! "Garnet Technologies Inc. has utilised Bajan Things for the past two years. The favourable response to the advertisements sent via this channel indicates to us that the eblasts are reaching our target demographic markets. We definitely intend to continue using their services." "Since we started using Bajan Things in our advertising program we have seen a dramatic increase in the number of persons coming to our business. We do our own survey as to how persons learned about us and many persons say 'Bajan Things". We consider Bajan Things to be affordable while providing a high level of exposure to our customer base - the age 10yr to 60yr group." "I have been using Bajan Things for over two years now because i have found their email advertising service to be an inexpensive and effective way of reaching my target audience (persons in Barbados)." "At Bajan Things they do what they say - they get the message delivered. During our start up they introduced Barbados Today to readers like no one else could." "My company's decision to utilise Bajan Things had as much to do with your extensive recipient base, your quick and competent response to my questions as it did with the way we have realised direct growth in our business and revenue levels after each online ad."